The fossil fuel companies -- producers of oil, coal, and natural gas -- are similarly expanding their operations in low- and middle-income countries where ensuring the growth of energy supplies is considered more critical than preventing climate catastrophe. “There is a clear long-run shift in energy growth from the OECD [Organization for Economic Cooperation and Development, the club of rich nations] to the non-OECD,” oil giant BP noted in its Energy Outlook report for 2014. “Virtually all (95 percent) of the projected growth [in energy consumption] is in the non-OECD,” it added, using the polite new term for what used to be called the Third World. Although the leaders of the other giant energy firms, including BP, Chevron and Royal Dutch Shell, are less outspoken than Tillerson, they are pursuing a similar marketing strategy. “Demand growth [for petroleum products] comes exclusively from rapidly growing non-OECD economies,” BP noted in its recent report on the global energy outlook. “China, India, and the Middle East account for nearly all of the net global increase.” Like ExxonMobil, BP and the others are hard at work expanding their capacity to sell fossil fuels in these growing markets. The EIA summarized the situation this way: “Companies in key parts of the U.S. coal supply chain -- both producers and railways -- have increased sales to Asia because of rising Asian coal demand, overall strong export prices, and lower U.S. consumption of coal to produce electric power.” Looked at from another perspective, diminished carbon emissions from coal in the United States -- much touted by President Obama in his embrace of natural gas -- has no significance when it comes to climate change, because of the greenhouse gases being produced when all that coal is consumed in Asia. In the Pacific Northwest, opposition to the coal terminals and the rail lines that will be so crucial to their operation -- some of which will traverse Indian reservations and pass through green-minded cities like Seattle -- is gaining strength. The process has been similar to the way climate activists mobilized against the Keystone XL pipeline that, if built, is slated to bring carbon-dense tar sands from Canada to the U.S. Gulf Coast. But the coal companies and their allies are pushing back, insisting that their exports are essential to the country’s economic vitality. “Unless the ports are built on the West Coast,” said Jason Hayes, a spokesman for the American Coal Council, U.S. suppliers won’t be viewed as “reliable business partners” in Asia. In the end, all these efforts to boost fossil fuel sales in Asia and other developing areas will have one unmistakable result: a sharp rise in global carbon emissions, with most of the growth in non-OECD countries. 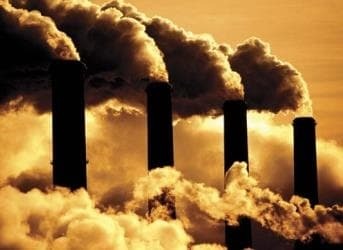 According to the EIA, between 2010 and 2040 world carbon dioxide emissions from energy use -- the main source of greenhouse gases -- will rise by 46 percent, from 31.2 billion metric tons to 45.5 billion. Little of this increase will officially be generated by the planet’s wealthiest countries, where energy demand is stagnant and tougher rules on carbon emissions are being put in place. Instead, almost all of the growth of CO2 in the atmosphere -- 94 percent of it -- will be sloughed off on the developing world, even if a significant part of those emissions will come from the combustion of U.S. fossil fuel exports. Above all, Big Energy is insuring that one small ray of good news when it comes to climate change -- the contracting use of coal, oil, and gas across the developed world -- will prove meaningless. The economic incentive to sell fossil fuels to developing countries is undeniably powerful. The need for increased energy in developing countries is no less indisputable. In the long run, the only way to meet these needs without endangering our global future would be through a mammoth drive to expand renewable energy options there, not by shoving carbon products down their throats. Rex Tillerson and his cohorts will continue to claim that they are performing a “humanitarian” service with their new “tobacco” strategy. Instead, they are actually perpetuating the fossil fuel era and helping to create a future humanitarian catastrophe of apocalyptic dimensions. At ~$40/ton delivered by rail to a port, how can US coal compete with AU coal? AU is mostly flat, US coal comes mostly from WY on the continental divide, a *long* way from any seaport. I don't agree with your premise argument or conclusion. "In the view of most scientists, an increase of carbon emissions on this scale will almost certainly lead to a global temperature rise of at least four degrees centigrade and possibly more by the end of this century. That’s enough to ensure that the changes we are already seeing, including severe droughts, stronger storms, raging wildfires, and rising sea levels, will be eclipsed by exponentially greater perils in the future." is not based in fact. Even the IPCC does not agree. The temperature response is likely to be under two degrees and the link to catastrophe does not exist. Comparing energy use to smoking is risible as access to energy is connected with all manner of good (health, wealth, even environmental advancement) for users whereas smoking is demonstratively destructive and costly. Lomborg is right that more are helped by access to cheap FF energy than are harmed by it even if you believe CO2 is bad. He also shows that it is very expensive and nearly impossible, practically speaking, to avoid a build up in CO2. Whereas adaptation is a relatively cheap and effective response. With your gross misrepresentation of the facts and skewed arguments you come up with a conclusion that reveals your political beliefs rather than truth. Here are a couple of quotes from an article in National Geographic last year. By all means, let's keep over a billion people living in stone age conditions so that the environmental elite in the rich, developed countries can whine about CO2 emissions and the poor polar bears in the Arctic. "About 3.5 million people, mainly women and children, die each year from respiratory illness due to harmful indoor air pollution from wood and biomass cookstoves." "...about 1.2 billion people—nearly as many as the entire population of India—still live without access to electricity, while 2.8 billion people rely on wood, crop waste, dung, and other biomass to cook and heat their homes." It may be a fallacy that if we do not have global warming, the Earth's climate will stay the same as we are used to. There is a 22,000 year Milanovich Cycle (named for the astronomer who discovered it) that says that over this length of time the Earth shifts from having the mostly water Southern Hemisphere tilted toward the Sun at Aphelion (when the Earth is farthest in it's revolution around the Sun from the Sun) to the mostly land Northern Hemisphere facing the Sun at Aphelion with the Southern Hemisphere facing the Sun at Perihelion. This is thought to drive the Pleisteocene ice age glaciations. And the clement period in which the Earth gradually warmed because the Earth was moving toward Southern Hemisphere aphelion is over and the Earth for the next 7,000 years or so has been moving toward Northern Hemisphere aphelion. In other words, the insulation from the greenhouse effect that we have been getting so far may have been what has been preventing another ice age, which would be more disastrous for human civilization than global warming is. As contrary to the idea that we are all environmental sinners this is, we may need to deliberately keep burning our coal and oil to hopefully fend off or mitigate global cooling --if we can and glaciation, then in about 5000 years when we pass peak Northern Hemisphere aphelion, perhaps THEN engage in global engineering with the skills we will have developed over that period of time to mitigate the extreme warming we will encounter then. Actually tweaking our carbon emissions so that the gloal temp stays "just right" is probably beyond our capabilities.